Some people pride themselves on the ability to remember names; others are simply terrible at it. But if there’s one type of name that everyone has trouble with, it’s eponyms. These are the people who discovered a disease, pioneered a treatment, or invented a test, and later had their work named after them. There are hundreds, if not thousands, of them, and it’s near impossible to keep them all straight. That’s where the new android application Eponyms tries to step in. It’s an application that is in our top 10 list for iPhone Medical apps, and just recently made a splash in the Android Marketplace. Opening the app, it’s quickly apparent that this is a no-frills affair. There is no splash screen, no advertisements, just a big database of eponyms. 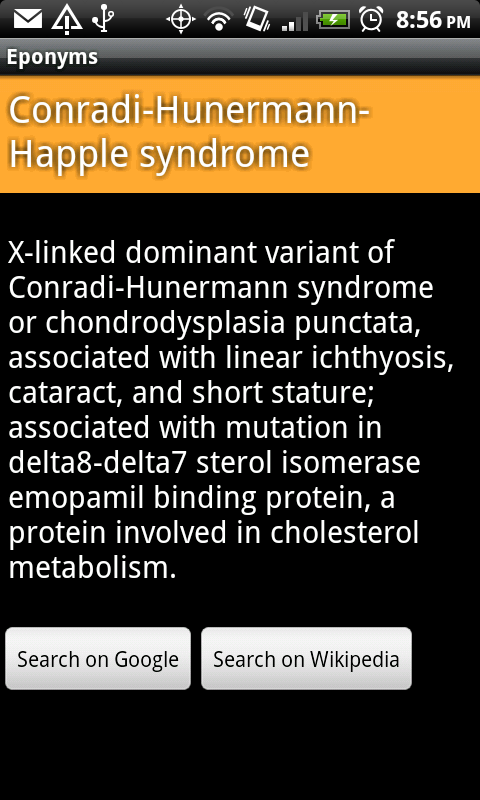 This makes the app easy to open and navigate, letting you get to your eponym as fast as possible. There are three super-menus at the top of the main page (all categories, favorites, and recent) followed by a category for every subdivision of medicine. 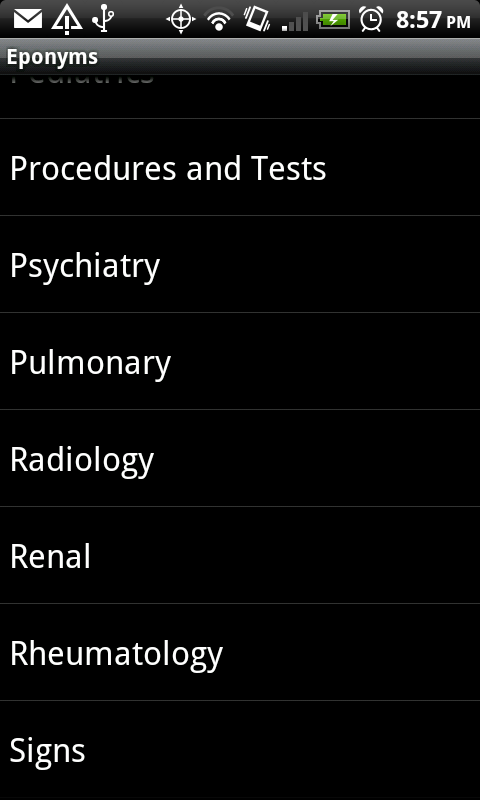 The app even has sections for lab tests and procedures as well as physical exam findings. It’s obvious that the author made every attempt to be thorough here. It would be nice to have a search bar here on the main page, though, as it would make for the quickest access when you know what you’re looking for. When you open a submenu, you see a search bar at the top and a long list of eponyms. Each eponym has a star next to it for easy addition to your favorites database. The search bar here is welcome, but comes a little too late, as noted before. A few entries seem out of place for an eponyms app, like “cri du chat.” Lastly, intermittent use of capitalization shows a drop in polish every now and again, but that’s getting nit-picky. Opening an eponym shows us the name, a brief description, and links to Google search or Wikipedia search for the eponym. This is the meat of the app, so we’ll spend a bit of time here. After the title comes a brief blurb about what the disease/test/etc. actually is. Most of these that I tested are succinct and accurate, but a few are a bit too brief and vague. It would be nice to have a bit more of the information seen in other databases as well (epidemiology, pathogenesis, treatment, etc.). The links to Google and Wikipedia are meant to flesh out these segments, but these sources aren’t credible enough to be used in a clinical scenario. The explanations themselves lack references, so their reliability is unknown to the user. Overall, this app does a solid job of what it sets out to do. I can open it, look up an obscure eponym, get a quick snapshot of what it is, and get on my way. It works very well as a quick reference. The breadth of topics this app covers is quite significant, but for this app to compare with offerings from Skyscape and Unbound Medicine, it would need to flesh out the information it offers and document a reliable, trustworthy source. The fact that this free app is a step away from comparing in quality to the major players is impressive in its own right. 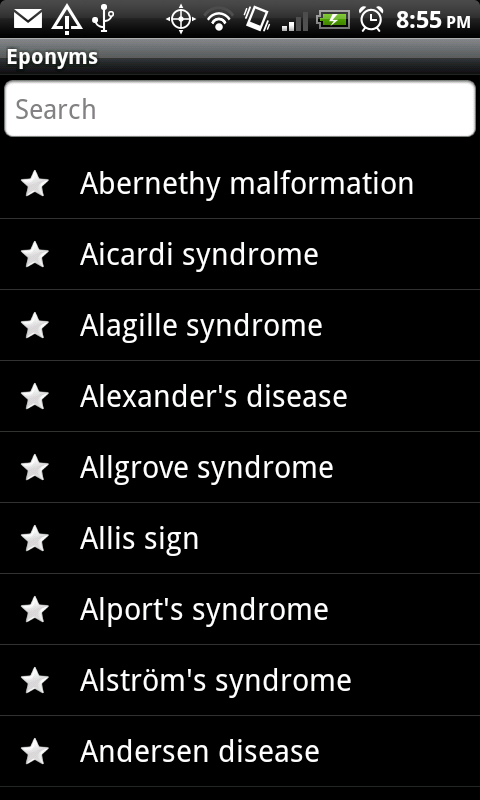 Link to download android medical app Eponym.